The Umineko no Naku Koro ni (うみねこのなく頃に, lit. When the Seagulls Cry?) anime adaptation of the visual novel series of the same name was announced by 07th Expansion and animated by Studio DEEN. The series aired in Japan on Chiba TV from July 2, 2009 to December 24, 2009 and has been licensed in the US by NIS America. Umineko no Naku Koro ni takes place in the year 1986, during the time frame of October 4 and October 5 on a secluded island named Rokkenjima. The head of a wealthy family named Kinzo Ushiromiya, who lives on and owns Rokkenjima, is near death, and eight of his family members arrive on the island to discuss how Kinzo's assets will be divided once he is dead. Also on the island are three family members who live there, five of Kinzo's servants, and his personal physician. After the eight family members arrive, a typhoon traps them on the island and shortly after people start to get mysteriously murdered. All of the episodes are named after moves in chess. Sales of the anime adaption were very poor in Japan. There is a rumor it sold under 500 copies out of all 13 Notes and their Special editions. Part of the fanbase dislikes the anime adaption due the poor quality of animation and lack of certain story elements. 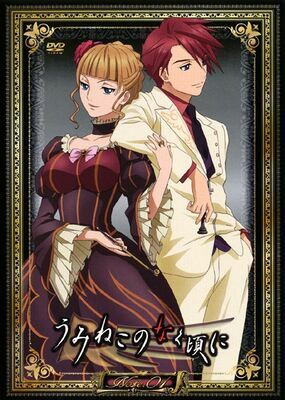 There are also several plot holes due to not having waited for Umineko no Naku Koro ni Chiru to be finished, leading to major plot inconsistencies and many of the games becoming unsolvable. Battler and George are approximately the same height, whereas in the visual novel, Battler is 180 cm and George is 170 cm. In several scenes, Shannon and Kanon have been shown together in front of Battler at the same time, which should be impossible, as they are the same person. In certain scenes and especially merchandise, Shannon has been shown to have real breasts. The cousins saw Natsuhi fall after being shot, which means that they should also have been able to see Sayo. Natsuhi's gun should be unloaded. It would be impossible for Battler to shoot with it. Shannon's corpse is found with the stake in her forehead instead at her side. In Beatrice and Virgilia's fight, Beatrice didn't float in air and even retreated her towers. Before her final attack, Virgilia summoned more than one Smoothed Mate, and impaled Beatrice with them instead of Gungnir. Also, she didn't summon Odin. When Virgilia realized she had been killed, she had two Smoothed Mate pierced through her instead of the lots of magic beams. And during Beatrice's explanation, it was shown that Virgilia was killed right before her final attack, and not before the start of the battle. Eva-Beatrice met Rudolf in a corridor, while she should be in front of Beatrice's portrait. Eva-Beatrice commanded the Chiester Sisters to kill Rudolf and Kyrie and bring their corpses to her. However, when they were killed, she teleported to them. Rudolf and Kyrie were killed in a corridor. But then they and Eva-Beatrice (wanting to "play" with the corpses) were shown in the hall. Eva-Beatrice and Chiester Sisters are less aggressive and more respectful with Beatrice when sending her away. Hideyoshi should arrive to scold Eva-Beatrice after she sent Beatrice away and after she "played" with Rudolf and Kyrie countless times. However, that didn't happen. Beatrice appeared right after Hideyoshi was killed. In the first twilight, Chiester 00 kills Rosa by cutting her throat. She was meant killed by having half of her face blasted,, as Sayo and Genji were using only the rifles in the first twilight. In the final episode, the first half of the Tea Party was completely omitted when Piece-Battler should have been seen investigating the crime scenes. A significant amount of blue truths and red truths were removed from this arc alone. Kumasawa and Gohda were bloodied when found dead. Originally they were only killed by being shot in the heads. Moreover, the window in the garden shed was big enough to fit a person inside, but in the visual novel, this should be impossible. In the ???? Scene, the red truths that Lambdadelta made to correct Battler's mistakes were completely removed. This page was last edited on 4 April 2017, at 16:14.